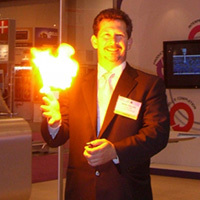 Let Our Trade Show Entertainers Capture Your Audience! Attending a trade show or convention? Want your booth to be crowded with onlookers, excited to see what you have to offer? Let About Faces help you make that happen. Our trade show caricature artists will provide entertainment for everyone that walks by, and also can provide every attendee who gets drawn with a souvenir that contains your company information on it. Our magicians and balloon sculptors are skilled at attracting attention and leaving onlookers amazed and smiling. Our henna artists add a classy touch, and we have many more live entertainment options for you to consider adding to your trade show display or booth. 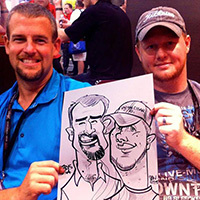 Caricature Artists – Great for any Trade Show! 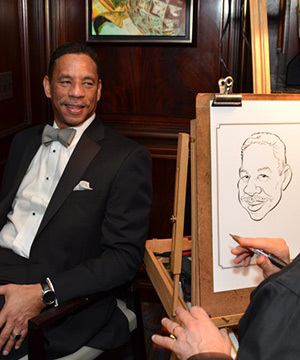 Our caricature artists will make your event a blast! In just mere moments, our artists will sketch hilarious cartoon pictures of you and your guests. Kids are enthralled, adults are entertained, and everyone leaves your trade show with a caricature as a party favor. Our caricature artists, magicians, clowns, fortune tellers, face painters, balloon twisters, jugglers, stiltwalkers, and mimes will add unique fun and draw crowds to help make your Trade Show or Convention a huge success! "Everything went great. The event was easy to book, easy to make last minute changes to the location, easy to add extra time to the event. Everyone was very pleased with the artists and had a lot of fun having their caricatures drawn for them. Thanks again for everything! If we ever need another caricature artist or entertainer at an event we are planning, we will definitely use About Faces Entertainment!" – Diane from the Tennessee Personnel Management Association concerning their Personnel Management Conference. "This was the great entertainment. The employees loved every minute while they were both here. We were so happy we are thinking of bringing them back for future events. Thank you"
– Karen Diehl from AAA Southern New England concerning their Employee Appreciation Event.